Charlotte plumbing company, E.R. 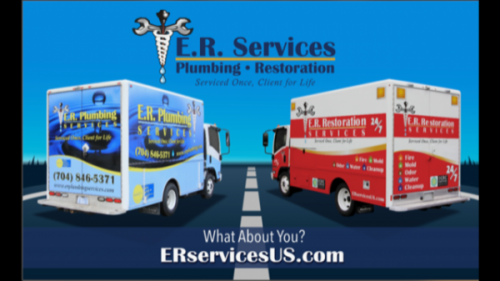 Plumbing Services, is expanding to offer fire, sewer and water damage restoration services and will go by the new name of E.R. Services. E.R. Plumbing Services has provided plumbing services to the Charlotte metropolitan area since 1997. As of Spring 2019, E.R. Plumbing Services is adding restoration services and doing business as E.R. Services. The expansion has included the purchase of restoration trucks and restoration equipment, plus the hiring and training of certified restoration experts. The new restoration trucks are wrapped and labeled as E.R. Restoration Services and are red and white, while the plumbing trucks are wrapped and labeled as E.R. Plumbing Services and are still blue, white and yellow. The new restoration services include water damage restoration, sewer damage restoration, fire damage restoration, mold removal and odor removal services. E.R. Plumbing Services and E.R. Restoration Services are branches of the umbrella firm E.R. Services. In the future, E.R. Services plans to expand to include more home and commercial services such as electrical and HVAC. E.R. Services will continue the company’s tradition of community service and even expand the company’s dedication to community involvement in the Charlotte area. In addition to the dozen existing charitable efforts E.R. Plumbing Services has sponsored and pursued on an ongoing basis, E.R. Services is adding one more volunteer and sponsorship effort to the company’s community involvement: the WSOC TV Channel 9 Books for Kids initiative. Now through April 12, 2019 the company is collecting new and gently used children’s books to be distributed to kids in underserved populations in the Charlotte area. For a complete list of community service opportunities, those interested can visit Do Good With Dave on the community service segment of the company website. Volunteer opportunities include serving through food collection drives, school supply donation drives, winter coat drives, ministry opportunities to make and deliver beds, the Ronald McDonald House in Charlotte, the annual CMPD toy drive and more. E.R. Plumbing Services staff volunteer through the year and welcome members of the community to join staff at approved donation collection sites and events.